Furuncle - acute purulent-necrotic inflammation of the hair follicle and the surrounding connective tissue. The disease is caused by Staphylococcus. Any boil predispose: pollution, scratches and abrasions of the skin, increased flow and excretion of fat skin, vitamin deficiency, metabolic diseases (diabetes). Symptoms. Initially, there is a dense inflammatory infiltrate in the form of a host of bright red color, towering above the skin in small cone. As the boil increases infiltration, flushing, peripheral edema. On the 3-4th day in the center of infiltration appears softening, which opened with the release of a small amount of pus. In place of a breakthrough reveals necrotic tissue greenish - rod boil (Fig. 6). In 2-3 days with pus and blood stem rejected with the formation of deep moderate bleeding ulcers (Fig. 7). After 2-3 days the ulcer has healed, leaving a scar. Furuncle develops 8 - 10 days, rarely longer. 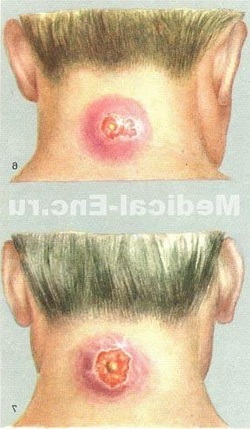 Boils can develop on any part of the skin where the hair. Most often boils localized on the skin of the neck, neck, face, back of hands, waist. Single boils usually do not cause the total reaction and do not cause any complications. In some cases, the development of boil accompanied by fever and malaise. Sometimes a boil complicated furunculosis (see), lymphangitis (see), lymphadenitis (see), thrombophlebitis (see), a cellulitis (see) or abscess (see). The most serious complications are observed in the localization of boil on the face, especially on the upper lip, nasolabial triangle. Significant development of venous and lymphatic network on the face predisposes to the so-called malignant course of boil - the emergence of thrombophlebitis facial veins, spread of infection in the cavity of a skull, which shows the overall poor condition, high fever, chills, severe headache, occurrence of meningitis (see), sepsis (see), sometimes fatal. It is unacceptable to squeeze, puncture, cut the tip of the boil, as this may be the cause of these severe complications. Treatment depends on the stage of the disease, localization and related complications. In the beginning, before the advent of pus,UV-irradiation in erythermal doses (every other day may come complete recovery). In a stage of ripening furuncle appropriate chip infiltrate solutions of antibiotics in novocaine (1-2 injections, daily with observance of the rules of reimbursement); the use of clean Ichthyol: a thick layer of Ichthyol placed on the skin and cover with a thin layer of cotton wool (1-2 times a day prior to the opening of boil), remove the Ichthyol warm water; used crystalline sodium salicylic or salicylic acid (apply on the surface of the boils with a layer thickness of 0.5 cm, strengthen dry bandage); 1-2 days in the centre of boils formed necrotic core that quickly rejected. After opening boil the wound thoroughly treated with hydrogen peroxide, furatsilinom - 1 : 5000 or etakrydina (with rivanol) - 1 : 1000 and dressings with hypertonic solution of sodium chloride. Bandaging produce daily to complete cleansing of the wound. Removing stud tweezers permitted only after its separation from the surrounding infiltrate - early removal, the gap rod leads to the exacerbation of purulent infection. With the same purpose during bandaging is recommended to lubricate the healthy skin around the boil 70% alcohol or with camphor spirit, brilliant green, methylene blue. Wiping the skin from the periphery to the center. To clean the wound, apply ointment dressing (5% syntomycin emulsion, 1% furatsilina, 5% streptocida ointment and others). For reduction of terms of treatment along with this therapy is appropriate to apply physical therapy (UHF, quartz, sollux). Surgical treatment is rarely used, only if the abscess formation (significant ulcer in the thickness of the skin) when the delay exclusion stud boil. Abscess is opened, piercing the skin pointed scalpel (pain - chloroethyl or local infiltration anaesthesia); forcibly remove the rod cannot, tampons are not required. A patient with a sore boil somewhere that persons subject to admission; shows a strict bed rest, intramuscular penicillin 300 000 f E every 3 hours, it is forbidden to talk; only liquid food. Prevention boils - see Pyoderma. Furuncle (furunculus) - acute purulent-necrotic inflammation of the hair follicle and the surrounding connective tissue, caused by the introduction of external pathogenic staphylococci. Predisposing causes to the development of a single boils are often external factors: pollution of the skin, particularly chemicals, coarse dust particles, in combination with friction, excessive sweating and the oiliness of the skin, and microtraumas and, in particular, scratching the skin. This is due to frequent complication boils itchy skin diseases. Frequent recurrence single boils can be explained by the skin sensitization to staphylococcal infections. Histopathological for boils noted necrosis of the hair follicles, sebaceous glands and connective tissue around which formed a broad shaft of neitrofilov and macrophages. In the surrounding connective tissue derma - swelling and enlargement of the blood and lymph vessels. The clinic. The beginning of the boil is ostiofollikulit, or a small nodule in the thickness of the dermis. In 1-2 days in the dermis is formed painful inflammatory infiltrate in the form of soft delimited site, rapidly growing and reaching values of hazelnut. The skin over the infiltration painted in purple-red color. For 3-4 days in the center node is detected insignificant fluctuation and on top of it forms a pustule. Soon a boil opened, it releases a small amount of pus, the removal of which is revealed necrotic tissue green - the so-called necrotizing rod. In the following days, the number of pus increases and with it rejected subjected demarcation necrotic core. Formed small bleeding ulcer is quickly filled with granulations and after 2 to 3 days heals a small scar. Most often boils localized in the skin of the upper arms, back of hands, neck, face, waist. Boils skin usually accompanied by a sharp edema. Single boils common cause reactions and only a few patients are accompanied by fever and malaise. In the localization of the limbs (the back of the hand, the fingers) boils can be complicated by lymphangitis and lymphadenitis. The most severe complication in the localization of boils on the face (upper lip, nasolabial triangle), is the formation of the so-called malignant boil, characterized by the appearance of septic thrombophlebitis facial veins with subsequent development of meningitis, sepsis or septicopyemia with the formation of abscesses in various organs and tissues. Malignant boils often develop as a result of extrusion, cutting the initial elements razor, irrational treatment. Clinical signs of malignant boil characterized by an increase infiltration and edema; the affected veins are often felt in the form of thick strands. The overall reaction manifested by fever, leukocytosis, acceleration ROHE. The occurrence of sepsis accompanied by fever relapsing-remitting type, numbness, by profuse sweating, dryness of the language. From the blood sow staphylococci. Until recently, a large percentage of malignant boils individuals ended lethal. With the introduction in the therapy of antibiotics for their timely application of mortality excluded. Single boils can be the cause of metastatic abscesses in various organs and tissues. Treatment. Locally often use the net Ichthyol in the form of so-called Ichthyol cakes (surface furuncle grease with Ichthyol and cover with a thin layer of cotton wool)imposed once a day and removed by wet with warm water. Ichthyol pellet apply to the opening of the boil; after opening - ointment (1% syntomycin, 2% white mercury and others) or hypertonic saline in the form of labels, strengthened by kleola. Circular bandages should not be applied because of the possible dissemination. At the same time it is expedient to apply a dry heat (heating pad, UHF); this reduces the treatment time and reduces pain. Compresses contraindicated. When changing labels skin around furuncle wipe 2% salicylic or with camphor spirit. In some cases shown radiotherapy (furuncles skin, scalp, large folds). General treatment for uncomplicated single boils (except boils skin) is optional. To expedite resolution boil recommended autohemotherapy, sulfa drugs, antibiotics. When complications of the lymphangitis and lymphadenitis shown antibiotics and sulfa drugs. In uncomplicated and especially complicated malignant boils person needs urgent treatment with penicillin, 100 000 IU every 3 hours; at the same time appoint sulfonamides. With single, but often recurrent boils recommended with the aim of desensitization to have a course of immunotherapy (staphylococcal vaccine, especially autovaccine, toxoid, and others) or autohemotherapy. Surgical treatment of boils rarely used in cases of significant education ulcer in the thickness of the skin, around the terminal, delays exclusion of the latter. Abscess is opened, piercing his wall pointed scalpel. Can be used locally (infiltration) anesthesia or freeze-chloroethyl. Attempts of forcible removal of necrotic stem invalid. The introduction of tampons not required.